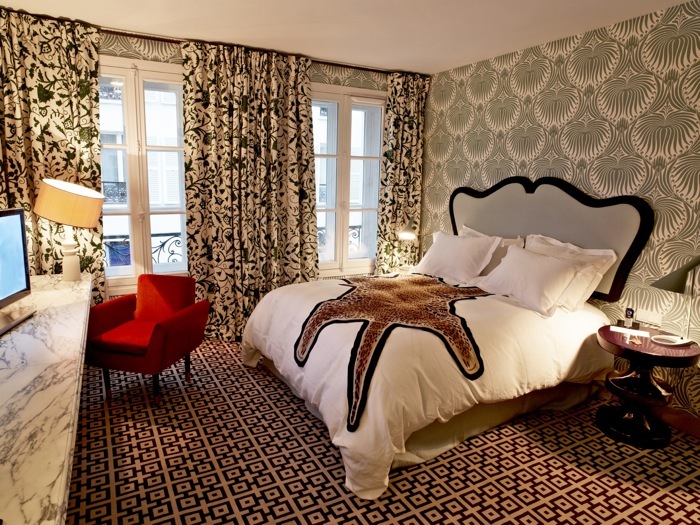 Hôtel Thoumieux might be exactly what you’re looking for: a tiny, but luxury boutique hotel, resolutely trendy, but romantic though and just as posh as it needs to be. 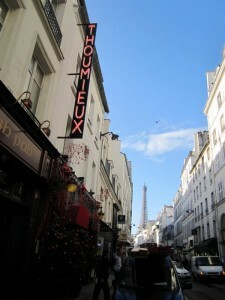 It is reasonably priced, has one of the best restaurants in the city and is located only a stone’s throw away from the Tour Eiffel. Need more? Not really. 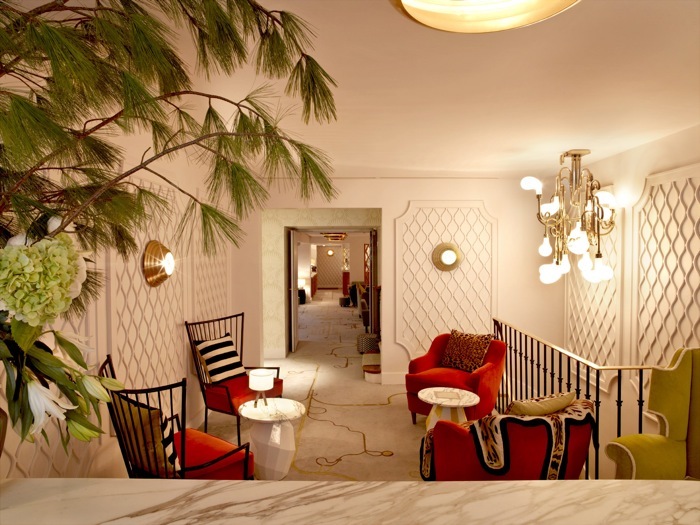 Hôtel Thoumiuex is what you can call a true gem: entirely redecorated by interior design star India Mahdavi, it offers one of the best values for your money in town. 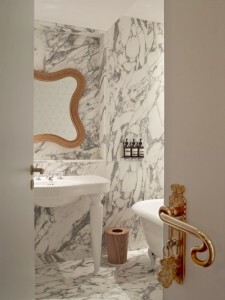 There are only fifteen rooms and one suite, all decorated with the Mahdavi’s magic touch, mixing colours, patterns, styles. It all ends up in a special, unmistakable atmosphere, feels a bit has-been and very hip though. Of course, you must not like her style, the clash of patterns or let’s say civilizations. You might also ask what the hell the roadkill is doing on your bed? You might even be tempted to put the lampshade right. I, for my part, love this mix and her sense of humour and would love to spend some time in a room rethought by Mahdavi. Standard size rooms are quite small (12 square metres) and cost 150.-€, superior rooms are bigger (20 square metres) and the suite at 33 square metres will cost you 400.-€. Besides the lovely location on rue Saint-Dominique giving you’re a view on the Eiffel Tower, this hotel has everything a modern nomad needs: free wifi, huge flat screen TV, an espresso machine, a mini bar with soft drinks for free, beauty products in the bathroom from the Australian brand Aesop, even an Ipad is waiting there for you with a couple of films to view. The only thing missing is a lift, but come on, this old building is not the Eiffel Tower either. 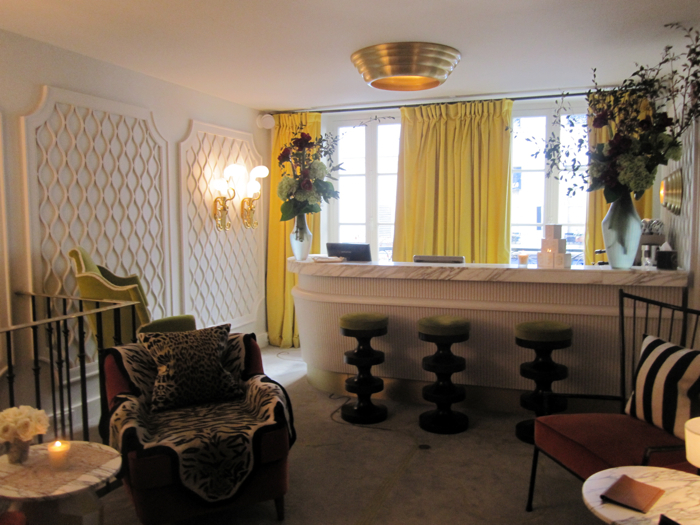 The hotel is located above the very popular Brasserie Thoumieux, which, since French chef Jean-François Piège bought the whole building together and with the Parisian restaurant tsar Thierry Coste, has become one of the trendiest places in town. And above all, there is the restaurant gastronomique of Jean-François Piège, a tiny, two-Michelin-star restaurant with only 20 places. Don’t forget to reserve your table when booking your hotel and it will be, read my lips, a moment of perfect happiness.